Microsoft Security Essentials provides online free antivirus protection for your computer. 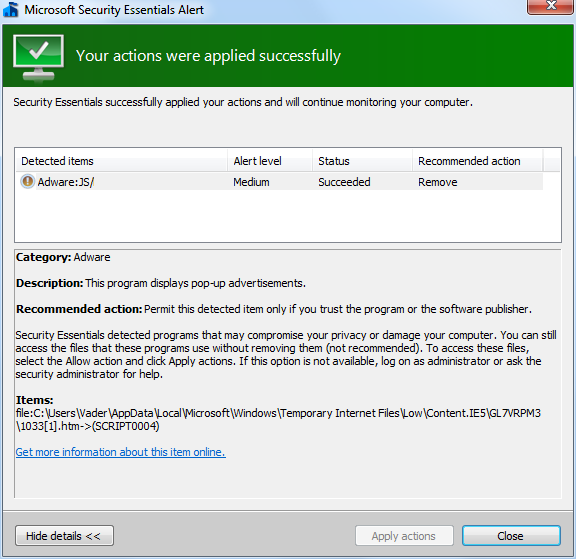 Here is a sample case showing how Microsoft Security Essentials Alert works when it detects a potential threat like an adware. The following Microsoft Security Essentials alert may inform you while you are browing internet web pages. This alert is informing you about a potential threat has been detected and asking your confirmation to remove the potential security threat. If you click on Clean computer buton, the free antivirus protection tool Microsoft Security Essentials will remove the related files. It is easy as to delete potential files by Clean computer buton. Security Essentials detected a potential threat on your computer. Click Clean computer to remove this threat. Of course you may wonder about the potential threat details and want to learn more. Then click Show details link buton. 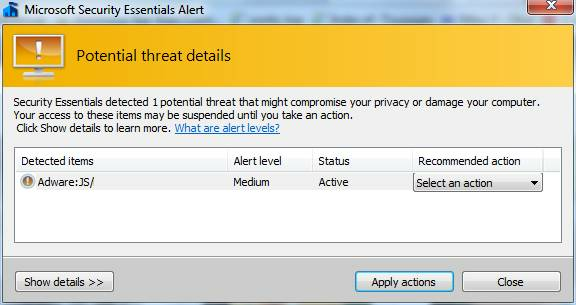 Show details will display the Potential threat details screen of the Microsoft Security Essentials antivirus tool. Now we are ready to clean computer by choosing the required action and let the Microsoft Security Essentials to process this action. Click on the dropdown list "Select an action" in the Recommended action column. For example I chosed Remove then click on Apply actions buton to remove the potential threat, adware file from the computer. Security Essentials detected 1 potential threat that might compromise your privacy or damage your computer. Your access to these items may be suspended until you take an action. Click Show details to learn more. What are alert levels? 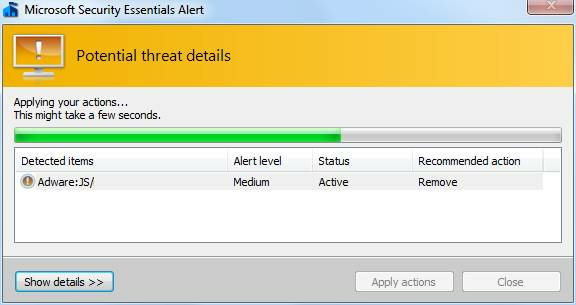 Microsoft Security Essentials Alert screen will give you details about the current ongoing process and applied actions. Finally the detected potential threat file is deleted from my computer successfully. The Microsoft Security Essentials Alert screen is informing the user about the category (adware), description of the cleaned threat, path of the removed threat, etc. Security Essentials successfully appied your actions and will continue monitoring your computer. Windows users can keep their free antivirus protection tool up to date automatically by using the Microsoft Security Essentials update schedules. If you have not yet download and install Microsoft Security Essentials tool from Microsoft, you can refer to Microsoft Security Essentials Download For Free Antivirus Protection guide.